Bawean is an island located in the Java Sea, about 80 miles or 120 kilometers north of Gresik. Administratively since 1974, the island was included in the district of Gresik, East Java Province. Since colonial rule Bawean island included in the district of Surabaya. Dutch (VOC) goes first to Bawean Island in 1743. Bawean has two districts namely Sangkapura and Tambak. A population of around 70,000 inhabitants which is a blend some tribes who came from the island of Java, Madura, Kalimantan, Sulawesi and Sumatra, including culture and language. Bawean residents mostly have livelihood as fishermen or farmers as well be working in Malaysia and Singapore, most of them already have permanent resident status in the country, besides the population in both countries Bawean also settled in Australia and Vietnam. Bawean majority ethnic population is Bawean tribe and other tribes for instance Tribe Java, Madura, Bugis, Mandar, Mandailings, Banjar and Palembang. The language used is the language Bawean. Madurese language is not like that have been considered equal. In Malaysia and Singapore, the mention of the tribe Bawean turned into Boyan. They call themselves the boyan, meaning the Bawean. Bawean word derived from Sanskrit, which means there is a sunrise. According to legend, around 1350, a group of sailors from the Majapahit Empire caught in a storm in the Java Sea and ended up stranded on the island of Bawean at sunrise. Bawean majority of the population is Muslim, while the non-Muslim population are migrants. Bawean Island are endemic deer (Axis kuhlii), whose habitat is only in Bawean Island. In addition to deer, Bawean also inhabited by eagles who has the body size and ability to fly low in the World. Hog warts and diverse marine life also exists on the island of Bawean. 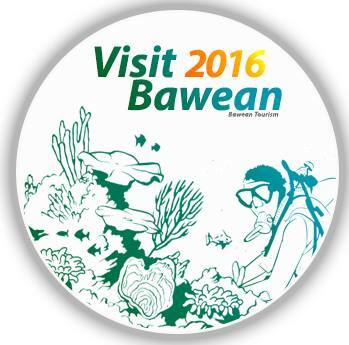 Bawean Tourism is a tourist information center online version. Here we are working to introduce Bawean, especially for the tourism sector. Given Bawean has great potential to be pushed into a tourist destination, both the domestic and international. We started working on promoting Bawean since 2011. Various promotional strategies we use that information about Bawean to the world community. Eg for a show of tourism, travel agents cooperation with the domestic and overseas. In addition to providing information about Bawean, to facilitate the access of tourists who will visit us prepare a tour package services to Bawean Island. We are also frequently used by the Provincial Government of East Java and Gresik to become ograniser event while they are visiting and activities on the island of Bawean. Indonesian Geologists Association (IAGI) also use our services for their field trip. Traveling program on Trans TV "My Trip My Adventure" also use our services for explore Gresik and Bawean. Bawean Tourism is committed to supporting responsible tourism activities on the environment that will lead to sustainable tourism development and tourists can contribute to preserve the natural and cultural heritage, as well as providing economic benefits to local communities.